A key discerning factor for many parents when they first tour our program is our play yard. If you've seen our yard, you know it is not filled with a commercial play structure. Its surface is not covered with grass. We have chosen not to deprive our children of the privilege of creativity in play by filling our outdoor space with those things. 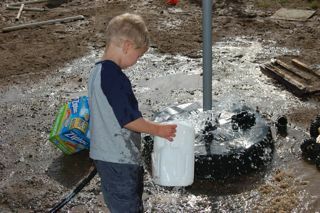 On any given day, you are likely to find children outdoors here enhancing their play with use of boxes, pvc pipes, shovels, rakes, a random assortment of lumber, plastic jugs, hoses, water, old Christmas trees, rope, old tires, tubs (metal and plastic), rocks, sticks, and whatever else they feel necessary. All of those items the children use in our yard are known in the field as "loose parts". 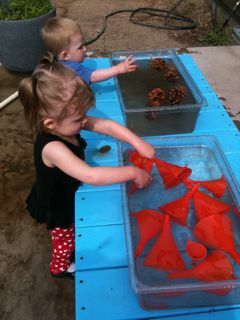 In other words, play parts in the yard that are loose for the children to utilize in their play at their will. While we have plans to improve our outdoor space, we vow not to take away the above things from the children. Anything we add will not get in the way of their creativity. I've often told those parents on tour that while our play yard may not look like much, it is often the heart and soul of our school to the children. Here is a link to a little piece from Slate Magazine that was emailed to me yesterday. It expands a bit on the play-yard concept we have consciously chosen. So parents, be sure to provide your children with enough loose parts to play and risk creatively. If you have extra loose parts of any sort that you'd like to donate to our yard, we would be more than happy to receive them!